It only took me about a year to go and see Andrew Lloyd Webber’s new production of The Wizard of Oz. I remember watching the movie when I was younger and, of course, I have seen the well known “prequel” Wicked on stage (it still bothers me now and then how the two stories don’t really fit together – but that’s just me being picky). Anyway, I was finally off to see the Wizard. It was the first week of the new cast but since I hadn’t seen the original cast I obviously can’t compare. The whole show is designed to entertain kids if you ask me. And there’s nothing wrong with that – the story is a family classic after all. However I couldn’t really relate to the often rather panto-like style of the whole production. I never have and never will be a fan of panto. A lot of the songs are well known and especially “Somewhere over the rainbow” received a huge round of applause. I can’t say the whole score really stuck in my mind after the show though. Beside the song I already knew I found it rather average to be honest. I did like the “Red Shoe Blues” a lot though and if asked I would class this one as the stand out song of the show (in my opinion it is a much stronger song than “Somewhere over the rainbow”). The costumes reminded me of Wicked a lot but then quite a few of the characters are the same so that’s not surprising. Glinda’s costumes have to be a favourite – all shiny and glittery. Sophie Evans was a very sweet and innocent Dorothy although I did find the part itself slightly irritating. All Dorothy ever does is either worry or moan about stuff (or run after her dog). I couldn’t see the character developing throughout the show. That, of course, is nothing I blame Sophie for. She did the best with the material she’d been given. Russel Grant was an ok Wizard – and that’s putting it really nicely. I hadn’t heard of him before so unlike many others I was able to watch his performance with an unbiased mind. He wasn’t completely bad but he didn’t amaze me either. His singing was a quite weak in my opinion and his acting was a bit wooden in places. I thoroughly enjoyed Edward Baker-Duly’s Tin Man and Paul Keating’s Scarecrow – a complete joy to watch. I wasn’t too keen on Martin Callaghan’s Cowardly Lion but then that has always been my least favourite part out of the three so I might be slightly biased. I had Florence Andrews on for Glinda and I thought she did a good job. I admit I would have loved to see Anna Woodside play the part – hopefully I’ll get the chance sometime this summer. Marianne Benedict as The Wicked Witch of the West was my personal highlight in the show. Great acting and such a fantastic voice – and very evil I should add. The ensemble seems a bit wasted in this show. They have so little to do beside walking around and doing minor dance routines from time to time. Ok, some of them get to climb and jump around as flying monkeys but that’s it really. 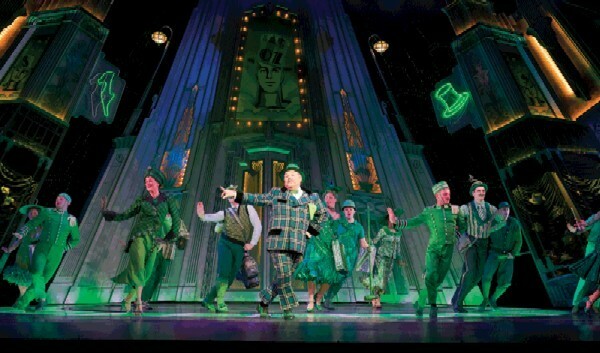 The Wizard of Oz is definitely a family show and it is designed to entertain kids. While that isn’t a bad thing it also means I have no desire to watch this one over and over again. It’s a very traditional musical and it does ok in transferring the well known story on to the stage. I did miss the magic of the story though (maybe I’m just too old to really dive into the story these days). But still, if you like the movie I recommend you give this show a try. Just be prepared to sit through some panto bits and don’t expect anything completely innovative and new. For more info and to book tickets go to http://www.wizardofozthemusical.com/.